You can also use your web browser’s built-in searching capability to find any word or phrase in this glossary. Abfraction: The notch at the gumline of a tooth that is the result of excessive forces placed on that tooth for an extended time. Previously these areas were thought to be areas of abrasion caused by toothbrushing. Abutment: A tooth or implant used to support / anchor a prosthesis (bridge, partial denture, etc.). Abscess: A localized inflammation due to a collection of pus in the bone or soft tissue, usually caused by an infection. Acute: Sudden or severe. Symptoms appear, change, or worsen rapidly. The opposite of chronic. Air Abrasion: The use of finely graded aluminum oxide powder administered under compressed air through a very fine tip. Useful in early small cavities, repair of chips, removal of discoloration and stains – usually does not require anesthesia. Also known as micro air abrasion and kinetic cavity preparation. Sandblasting instead of drilling. Amalgam: A dental filling material, composed of mercury, silver and other metals, used to fill teeth. Alveolitis: Some people will experience localized inflammation and infection in the tooth socket 48 hours after surgery. This has commonly been called a dry socket (alveolitis). It is not dry, however, and the name is derived from the appearance of the socket which is commonly void of a normal blood clot or granulating (healing) tissue. Statistically, it is more common in people older than 25 years and in women. It is also seen more often in people who had to have their tooth removed than people who elected to have them removed. Alveolitis will occur in 1% to 5% of people regardless of the surgeon’s skill or surgical method chosen. A dry socket is typically the result of something that has dislodged the normal blood clot, such as smoking, drinking through a straw, brushing the area, or trying to clean the extraction site. Anesthetic: A class of drugs that eliminates or reduces pain. Apex: The tip or end of the root of the tooth. Apicoectomy: The surgical removal of the tip of a tooth root. Bicuspid: A two-cusped tooth found between the molar and the cuspid. Biopsy: A process of removing tissue to determine the absence or existence of pathology. Bitewing x-rays: X-rays taken of the crowns of teeth to check for decay as well as the supporting bone between teeth. Bleaching: The technique of applying a chemical agent to the teeth to whiten them. Bonding: Often considered the same as tooth-colored filling. Technically it is a process to chemically etch the tooth’s enamel to better attach or bond tooth-colored filling material, veneers, or crowns. Bridge: A non-removable restoration that is used to replace missing teeth. Bruise: Bruises occur when blood is released from the capillaries and is trapped under the skin. Buccal: Refers to the cheek side of back tooth. Canine tooth: The second tooth from the big front tooth, commonly called the eye tooth or cuspid. Cap: Another term for crown. Cavity: The lay term for tooth decay. Also, the technical term for the hole that is left after decay has been removed. Cement: A special type of glue used to hold a crown in place. It also acts as an insulator to protect the tooth’s nerve. 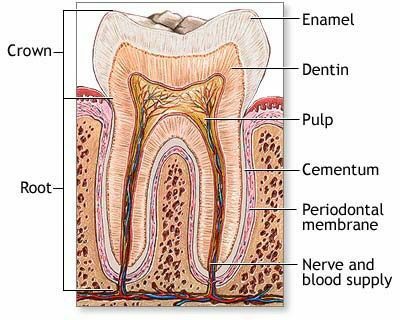 Cementum: The very thin covering over the root of the tooth (nerve > dentin > cementum). Chronic: A condition that is continuous or persistent over an extended period of time. The opposite of acute. A chronic condition is one that is long-standing, not easily or quickly resolved. Clenching: The forceful holding together of the upper and lower teeth. Composite: A tooth-colored filling made of plastic resin and porcelain. Cosmetic dentistry: Any dental treatment or repair rendered to improve the appearance of the teeth or mouth. Crown: The portion of a tooth that is covered by enamel, that is above the gumline. Also a dental restoration that covers the entire tooth and restores it to its original shape. Crown lengthening: A surgical procedure exposing more tooth for restorative purposes (removes gum and/or bone). Cusp(s): The point of a tooth’s chewing surface. Dental floss: A thin string that is inserted between the teeth to remove food and plaque. See more about flossing, click here. Dental hygienist: A dental professional specializing in teaching oral health and also cleaning the teeth by removing plaque and calculus. Dental hygienists must be licensed, and their degree is RDH (registered dental hygienist). Denture: A removable appliance used to replace teeth. A complete denture replaces all of the teeth, a partial denture replaces some teeth. See also partial denture. DDS: Doctor of Dental Surgery or DMD, Doctor of Dental Medicine. Degrees given to dental school graduates. Both degrees are the equivalent, it just depends on which degree a particular dental school confers. Dental school is four years of training after a college degree (same as a medical doctor). Direct restoration: Restorations in dental terminology refer to repairs of teeth, like fillings; however, there are many ways to repair teeth in addition to fillings. Fillings, whether they are gold foil, silver/amalgam, or tooth-colored composite fillings are all placed directly into teeth and are completed as one continuous procedure – these are direct restorations. Indirect restorations include inlays, onlays, and crowns. These types of restorations are made after the tooth has been shaped (also called prepared), and are cemented or bonded in as a separate procedure – these are indirect restorations. Distal: Refers to the side of tooth, between teeth, towards the back. See mesial. Extraction: The removal of a tooth. See Care of Your Mouth After An Extraction. Exostosis: The overgrowth of normal bone. Extracoronal: The outside of the crown of the tooth. Facial: Refers to the cheek(lip)side of a front (or back) tooth. See buccal, lingual. Filling: Material used to fill a cavity or replace part of a tooth. Fluoride: A chemical compound used to prevent dental decay, utilized in fluoridated water systems and/or applied directly to the teeth. Frenum: Muscle fibers covered by a mucous membrane that attaches the cheek, lips and or tongue to associated dental mucosa. Frenectomy: The removal of a frenum. Gingivitis: An inflammation or infection of the gingiva (gum tissue); the initial stage of gum disease. Gluma: Gluma is a desensitizing chemistry for treating and preventing dentinal hypersensitivity. Gluma’s patented (Heraeus Kulzer) glutaraldehyde/HEMA (2-hydroxyethyl methacrylate) formula acts in seconds to seal dentinal tubules, preventing the fluid shifting recognized as the primary cause of localized hypersensitivity. Gluma also inhibits the growth of bacteria, which are also indicated as a cause of sensitivity. Gluma’s patented formula works within the dentinal tubule complex by reacting with protein fluids to form a physiological seal within the tubules. No surface layer is formed, making Gluma ideal for use under all indirect restorations. Gum disease: See periodontal disease. High noble metal: See metals, classification of. HIPAA: The HIPAA privacy rules, which healthcare providers must comply with beginning April 14th, 2003, are part of a broad band of legislation contained in the Health Insurance Portability and Accountability Act, or HIPAA, which Congress adopted into law in 1996. See more, click here. Hypersensitivity: Typically refers to tooth pain that is caused very easily and with a stimulus that normally would elicit no feeling. Immediate denture: A denture constructed for immediate placement after removal of teeth. Impacted tooth: An unerupted or partially erupted tooth whose complete eruption is unlikely. Implant: An artificial device, usually made of a metal alloy or ceramic material, that is implanted within the jawbone as a means to attach an artificial crown, denture, or bridge. Incisal edge: The biting edge of front teeth. Compare to occlusal surface. Incisors: The four front teeth referred to as central and lateral incisors, located in the upper and lower jaws and used to cut and tear food. The central incisors are the two teeth in the middle of the mouth and the lateral incisors are next to the central incisor, one on each side. Indirect pulp cap: A procedure in which the nearly exposed pulp is covered with a protective dressing to protect the pulp from additional injury and to promote healing and repair via formation of secondary dentin. Indirect restoration: Restorations in dental terminology refer to repairs of teeth, like fillings; however, there are many ways to repair teeth in addition to fillings. Fillings, whether they are gold foil, silver/amalgam, or tooth-colored composite fillings are all placed directly into teeth and are completed as one continuous procedure – these are direct restorations. Indirect restorations include inlays, onlays, and crowns. These types of restorations are made after the tooth has been shaped (also called prepared), and are cemented or bonded in as a separate procedure – these are indirect restorations. Inlay: A strong, durable material made outside the mouth used to replace part of a tooth (can be metallic or tooth-colored) and is cemented or bonded once it is constructed. Compare to a filling which is packed into the tooth. See more about inlays. An inlay is an indirect restoration. Interproximal: The area between two adjacent teeth. Intracoronal: The area inside the crown of a tooth. Intraoral: The inside of the mouth. Labial: The area pertaining to or around the lip. Laser Cavity Detection: A laser diode provides pulsed light of a defined wave-length that is directed onto the tooth. When the light meets a change in tooth substance, it stimulates fluorescent light of a different wavelength. This is translated through the handpiece into an acoustic signal, and the wavelength is then evaluated by an appropriate electronic system. See more about it, click here. Lingual: The area pertaining to or around the tongue. Also referring to the tongue-side as opposed to the cheek-side. See buccal, facial. Local anesthetic: The injection given in the mouth to numb the areas where a tooth or area requires a dental procedure. Often referred to as Novocain. Malocclusion: The improper alignment of teeth. Maryland bridge: The name that has become synonymous with any resin bonded fixed partial denture (bridge). Typically, a Maryland bridge does not require as much shaping for the anchor teeth like a conventional bridge. Mastication: The act of chewing. Mesial: Refers to the side of tooth, between teeth, towards the front. See distal. Mesiodens: A small supernumerary (extra, exceeding the usual number) tooth, occurring singly or paired, generally palatally (roof of the mouth) between the maxillary central incisors (two upper front teeth). Metals, classification of: The noble metal classification system has been adopted as a more precise method of reporting various alloys in dentistry commonly used in crowns, bridges and dentures. These alloys contain varying percentages of gold, palladium and/or platinum. Molars: The broad back teeth, used for grinding food are considered the largest teeth in the mouth. In adults there are a total of twelve molars (including the four wisdom teeth, or third molars), three on each side of the upper and lower jaws. Ideally, a healthy mouth usually does not include wisdom teeth. Nitrous oxide: A controlled mixture of nitrogen and oxygen gases (N2O) that is inhaled by the person in order to decrease sensitivity to pain and/or anxiety. Also referred to as laughing gas. Novocain: A generic name for the many kinds of anesthetics used in the dental injection, such as Xylocaine, Lidocaine, Novocain and other local anesthetics. Novocain has not actually been used for decades. See local anesthetic. Occlusal x-ray: An intraoral x-ray taken with the film held between the teeth in biting position. Occlusal surface: The chewing surface of the back teeth. Compare to incisal edge. Occlusion: Any contact between biting or chewing surfaces of upper and lower teeth. Onlay: A strong, durable material made outside the mouth used to replace part of a tooth, including one or more points or cusps of the tooth, (can be metallic or tooth-colored) and is cemented or bonded once it is constructed. Compare to a filling which is packed into the tooth. Also compare to an inlay, which does not replace a cusp. An onlay is an indirect restoration. Oral surgery: The removal of teeth and the repair and treatment of other oral problems, such as tumors and fractures. Orthodontics: A specialized branch of dentistry that corrects malocclusion and restores the teeth to proper alignment and function. There are several different types of appliances used in orthodontics, one of which is commonly referred to as braces. Overbite: Refers to the vertical overlap of teeth. Everyone has an overbite, what varies is how much. Overjet: Refers to the horizontal overlap of teeth. Everyone has an overjet, what varies is how much. A substantial overjet is sometimes referred to as “buck” teeth. Palliative: Treatment that relieves pain but is NOT curative. Palmer Notation: see Tooth Numbering. Panorex: An extraoral full-mouth X-ray that records the teeth and the upper and lower jaws on one film. Partial denture: A removable appliance used to replace one or more lost teeth. Pediatric dentistry: The specialized branch of dentistry that deals solely with treating children’s dental disease. Also referred to as pedodontics. Periapical: The area that surrounds the root tip of a tooth. Pericoronitis: An inflammation of the gum tissue around the crown of a tooth. Periradicular: The area which surrounds a portion of the root of the tooth. Permanent teeth: The thirty-two adult teeth that replace the baby, or primary teeth. Also known as secondary teeth. Pit: A recessed area found on the surface of a tooth, usually where the grooves of the tooth meet. Pontic: An artificial tooth used in a bridge to replace a missing tooth. Premolar: Another name for bicuspid. Primary teeth: The first set of teeth lasting until the permanent teeth come in. Also referred to as deciduous teeth or baby teeth. Prophylaxis: Teeth cleaning: the scaling and polishing procedure performed to remove calculus, plaque, and stains from the crowns of the teeth. Prosthesis: The technical term for some artificial part. A partial denture is called a removable prosthesis. A bridge is called a fixed prosthesis. Prosthodontics: The dental specialty dealing with the replacement of missing teeth and other oral structures. Pulp: The hollow chamber inside the crown of the tooth that contains its nerves, blood vessels, and connective tissue – often considered synonymous with the ‘nerve’ of the tooth. Pulpectomy: Removal of the entire pulp from the canals in the root. See more about root canal treatment. Pulpitis: An often painful inflammation of the dental pulp or nerve. Pulpotomy: The removal of a portion of the tooth’s pulp. Quadrant: The dental term for the division of the jaws into four parts. There are four quadrants in the mouth. Two upper and two lower quadrants, both divided at the midline of the mouth. Resorption: The breakdown or dissolving of a hard structure like bone or tooth. Restoration: Any material or device used to replace lost tooth structure (filling, inlay/onlay, crown) or to replace a lost tooth or teeth (bridge, dentures, complete or partial). Retainer: A removable dental appliance, usually used in orthodontics, that maintains space between teeth or holds teeth in a fixed position until the bone solidifies around them. Also a technical term for bridge anchor or abutment. Retrograde filling: A method of sealing the root canal by preparing and filling it from the root tip, generally done at the completion of an apicoectomy. Root: The part of the tooth below the crown, normally encased in the jawbone. It is made up of dentin, includes the root canal, and is covered by cementum. Root canal therapy: The process of treating disease or inflammation of the pulp or root canal. This involves removing the pulp and root’s nerve(s) and filling the canal(s) with an appropriate material to permanently seal it. Root planing: The process of scaling and planing (smoothing) exposed root surfaces above and below the gumline to remove all calculus and plaque. Scaling: A procedure used to remove plaque, calculus and stains from the teeth. Socket: The hole in the jawbone into which the tooth fits. Space maintainer: A dental appliance that fills the space of a lost tooth or teeth and prevents the other teeth from moving into the space. Supragingival scaling: The removal of calculus and plaque found on the tooth above the gum line. Temporomandibular joint (TMJ): The connecting hinge mechanism between the upper jaw and the base of the skull – the jaw joint. Temporomandibular joint (TMJ) syndrome: The problems associated with TMJ, usually involving pain or discomfort in the joints and ligaments that attach the lower jaw to the skull or in the muscles used for chewing. Third molar: The last of the three permanent molar teeth, also called wisdom teeth. There are four third molars, two in the lower jaw and two in the upper jaw, one on each side. Some people are born without third molars, and not everyone that has wisdom teeth has four of them. See more about wisdom teeth, click here. Tooth Numbering: standardized system for referring to specific teeth. Torus: A bony elevation or protuberance of normal bone. Usual locations are the middle of the roof of the mouth and on the tongue-side of the lower jaw bone. Trismus: a sustained spasm of the jaw muscles. Veneer: An artificial filling material, usually plastic, composite, or porcelain, that is used to provide an aesthetic covering over the visible surface of a tooth. Most often used on front teeth. Xylitol: a naturally occurring sweetener, that does not cause decay. See Xylitol. X-ray: X-rays were discovered by physicist Wilhem Conrad Roentgen, November 8, 1895. X-ray is derived from the German, X-strahl (“X” designating unknown, and strahl meaning “ray or beam”). Today x-rays are recognized as important diagnostic tools to visualize areas inside bodies / objects that are otherwise undetectable. In dentistry x-rays are used to detect cavities, and also for examining the supporting jawbone and surrounding structures.